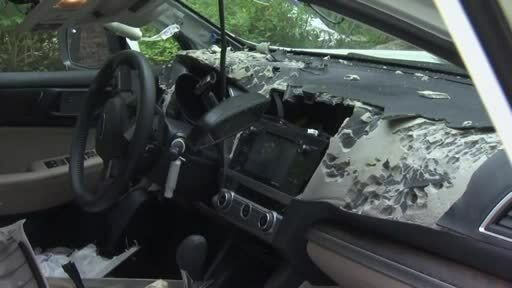 CANTON, Conn. (AP) — What might be the world's hairiest vandal has destroyed the interior of a Connecticut woman's car. Linda Morad tells WFSB-TV she was house-sitting in Canton last Friday when she noticed her car lights on and heard strange noises. She called police. Officers found a full-grown bear that had somehow gotten into Morad's car and could not get out. Police opened a door, ran to the other side of the vehicle, and the bear scampered into the woods. The car's exterior was almost untouched, but the car's interior was torn to shreds. Morad says her insurance company tells her the vehicle is totaled. There was no food in the car, but Morad had taken some garbage to the dump earlier that day. She thinks the smell attracted the bear.